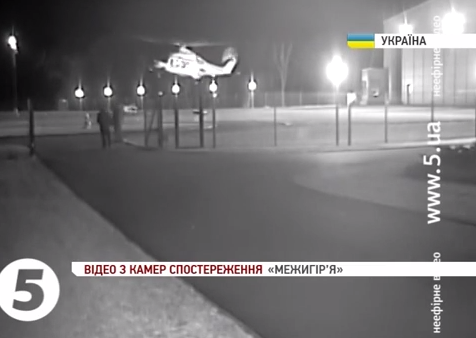 A new video has emerged which claims to show the former Ukrainian President Victor Yanukovych and his aides leaving via helicopter. It is not currently known as to whether this footage was filmed in Kiev, from where Yanukovych fled yesterday, or somewhere else in the country. The latter scenario would imply that the ousted President would no longer be in Ukraine at all, with speculation rife that he had tried to flee by jet yesterday, only to be blocked by border officials. The video was posted to the Guardian news website, and the first identifiable helicopter matches news reports from 2012 over Yanukovych’s procurement over two Agusta AW-139 choppers. The board numbers, UR-CRB and UR-CRG are visible in the video (below) and match 2012 reports. The helicopters are reported to have cost the Ukrainian taxpayer around £500,000 ($800,000) a year.